Ninfa wasn’t always such a peaceful haven, indeed, its early history is violent and bloody. It was first recorded in 750 AD when the Byzantine emperor Constantine V gave it to Pope Zacharias. Ninfa was strategically important in controlling the Appian Way and the coastal plain which made it a target for 9th century Arab invaders. 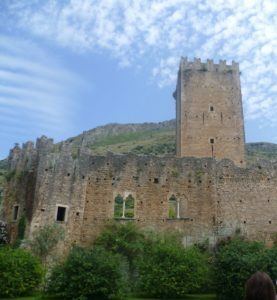 Subsequent popes fortified it and, by the middle ages, it was a walled town with towers, churches, and a castle. Two popes were crowned there: Pope Alexander III and the Anti-Pope Victor IV. The Holy Roman Emperor Frederick Barbarossa sacked it in 1171. The tides of history moved on and Ninfa became a backwater. In the 12th century it was bought by the Caetani family. They were a quarrelsome lot and, eventually, a family feud led to a war which virtually destroyed the town. 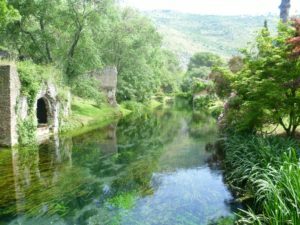 Ninfa stumbled on for another two and a half centuries but, in 1680, it was abandoned, fell into ruin and was soon lost amid the vegetation. 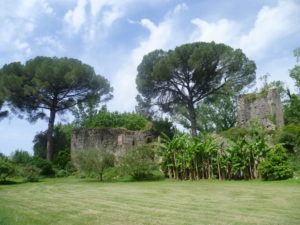 It didn’t revive until 1920, when its owner, Gelasio Caetani, decided to turn the ruined town into a garden. 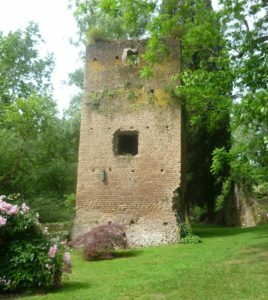 He stripped excess vegetation from the half tumbled-down the town walls, churches, and numerous towers which once belonged to various wealthy families and rebuilt them just enough to make them safe, leaving them as romantic ruins and a haven for wild life. He brought in plants from all over the world and set about creating a garden like no other. The general impression is that it has grown organically. 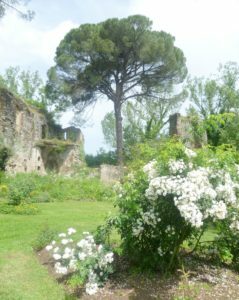 Wild flowers mix happily with exotic plants which move seamlessly from a stream with a Roman bridge, to a ruined church with fading medieval wall frescoes, to a bamboo wood. It is looked after by five gardeners – the jobs are hereditary being passed down to sons, and now, daughters. 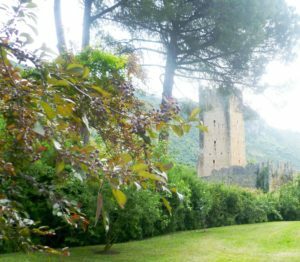 Princess Lelia, the last of the Caetani, set up the Fondazione Roffredo Caetani to run Ninfa after her death, which, together with the World Wildlife Fund, looks after the 2000 acres of Nature Reserve. It is an organic eco-system which, with judicious tweaking, runs itself; for example, the fruit is left on the trees for the birds. As Estella, the curator’s wife who showed us round, said, ‘One barn owl can catch two thousand rodents a year’. She pointed to a nearby tower which was home to four species of owl. The moment I walked in, I was struck dumb by the bird song. 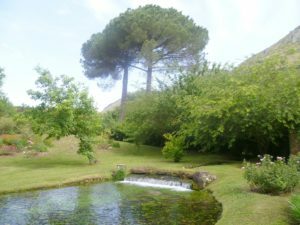 When I was a child living in the country, the air was full of birdsong but it wasn’t until I entered the gardens at Ninfa that I remembered it. The memory was so vivid that, that evening, I wrote in my diary: I couldn’t stop smiling. I could feel tears lurking not far away. A place that can have such a powerful effect is special indeed. 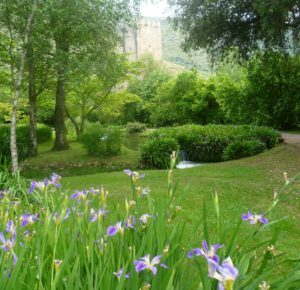 Ninfa delights the senses: everything you look at is beautiful, and scent and bird song fill the air. I especially loved the informality of it. Nature is allowed to go where it wills and a little pruning is all that’s needed. I love the ordered beauty of gardens like the Generalife gardens at the Alhambra in Granada but its approach is different. There, nature has been formalized and directs the visitor to see the gardens as the architect who created them wanted them to be seen. It is a religiously symbolic garden, displaying in the contrast between fountains, the water within its bounds of marble, and the carefully selected and maintained plants, the eternal truths to those whose hearts are attuned. 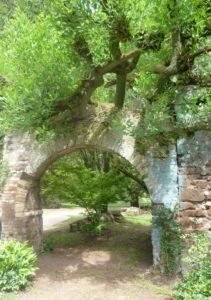 Ninfa allows visitors the space to attune themselves to what is meaningful to them and my reaction was personal to me. It, too, is a spiritual place but in a different way. As Kipling put it in his poem The Glory of the Garden, ‘For the Glory of the Garden occupieth all who come.’ There’s room for all. 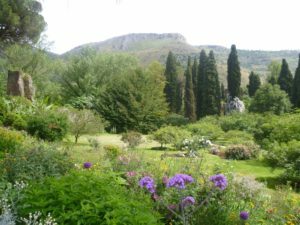 And, on this icy January day, the garden at Ninfa in May is where I most want to be. What a wonderful post! Glorious photos and magical descriptions. A perfect tonic for January in England. Thank you, Jan. I actually felt warmer while I was writing it! How lovely. I can’t but think of Capability Brown and wonder if the Caetani who created the gardens knew him in another life. What a heavenly sanctuary! Not surprised you are drawn there on a cold January day. Lucky me, I am off to Florida this week where the temperature is apparently 60 degrees, though the aircon tends to negate that somewhat. Lucky you! You’ll see different flowers, trees and birds, too. I hope you have a wonderful time.